Liverpool FC will host a local fan event next week, offering a jam-packed day of entertainment and activities to get fans geared up for the Reds' game against Torino FC at Anfield on Tuesday night. 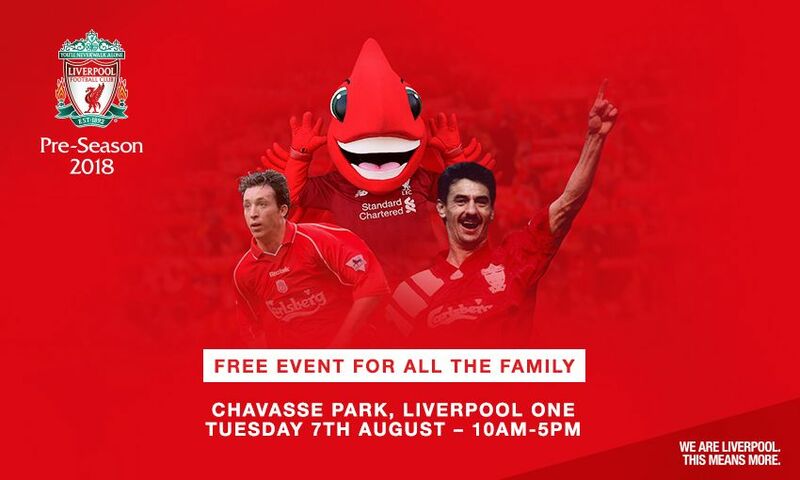 From 10am, Liverpool ONE's Chavasse Park will play host to various fun activities and entertainment - such as face painting, live music performances, a chance to meet the club's official mascot, Mighty Red, and much more. Fans can also show off their skills during mini football games and challenges. Supporters will also have the opportunity to see Reds legends Ian Rush and Robbie Fowler take part in a Q&A session, hosted by Capital FM's Baz Todd, from 2pm, and the chance to see local musician Jamie Webster take to the stage in the afternoon, along with other bands throughout the day. In the run up to kick-off, the Family Park on Anfield Road and Paisley Square will be open from 3.30pm, so supporters can soak up the atmosphere of Anfield before the game. Fans visiting the Family Park and Chavasse Park could also be in with the chance of winning a spot at a meet and greet session with some of the team. Liverpool manager Jürgen Klopp and first-team stars will spend some time greeting and interacting with fans off the pitch, before and after kick-off. At full-time, players will also be handing out gifts and golden tickets, giving lucky Reds fans unforgettable Anfield experiences, such as invitations to open training sessions. Plus, there will be chances to win* meet and greet sessions with the team via a prize draw for those who purchase tickets to the game from now until Friday. Peter Moore, LFC's chief executive officer, said: "As our pre-season comes to a close, we're bringing the celebrations back on home ground and would like to welcome all our local fans to join us in welcoming the team back to Anfield. "Our family fun day offers something for everyone, with lots of activities happening around the city, from live entertainment and music to fun games and challenges. It's a great way to get our 2018-19 season under way and we hope everyone enjoys the festivities before joining us at Anfield to watch our game against Torino get under way." Tickets for the friendly with Torino are priced from £9-33 for adults, £9-25 for over 65s, £9-16.50 for young adults (aged 17-21) and just £5 for juniors (aged 16 and under). *Terms and conditions apply – click here for more details.